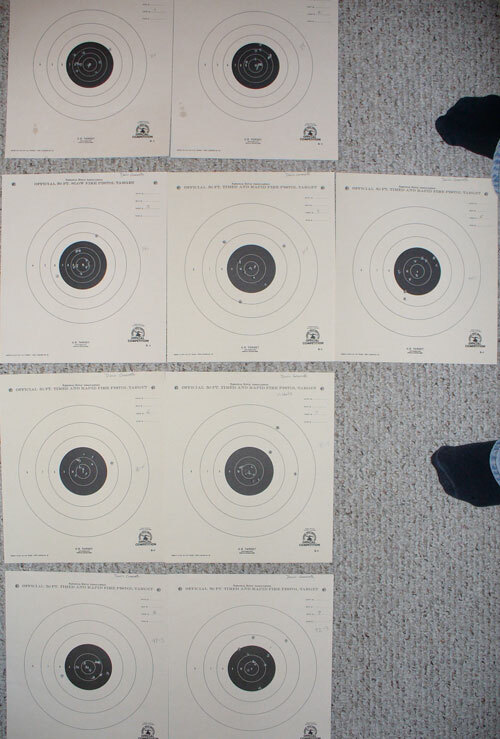 Today I shot an 824-19X out of 900 at the match at the Flushing Rifle & Pistol Club. I definitely shot better than my last match, a 785 shot at Grand Rapids. I’m still getting these crazy fliers that really sink the scores. Most of my fliers were high and right, although a few were off to the left. The scores were 89 and 88 for slow fires. 86, 91, 94 for NMC. 96 and 91 for timed fire. 97 and 92 for rapid fire. The slow fires were good scores for me, but the rest was too erratic. It’s those fliers. I’m shooting too fast. Some of the timed and rapid fires I probably shot in 6 or 7 seconds. I forced myself to hold the gun up for the whole rapid fire string, even though I finished shooting. I could’ve fired another 2 or 3 shots. For the next match, I intend to hold the slow fires about where they are, but shoot nothing lower than a 95 for the rest. I’ll do that by slowing down so I can take each shot when it’s ready, so as to do away with those fliers. I’ll tell Adam to come out to the next event. He tell me it will improve your shooting. Also, he tells me you can’t handle the heat of Wendy’s Chili. I admit, I’m a shadow of my former self in regards to spicy food. However, the last 4 meals I’ve made have each included hot sauce! Adam’s incessant joking on the topic has actually made me remember to pull the habenero sauce out of the fridge. Below the belt! That’s an insult to my insult. I’d never hit below the belt. Can’t we all just get along?!? ?